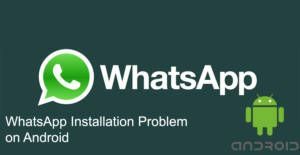 There are several installation problems on WhatsApp on Android and there are different error codes for these problems. You will find list of errors on here. We are going to provide these problems for you on here, you can find solutions when you click on the related error code name. If you would like to ask any questions about installing errors of WhatsApp, please let us know. See Also: How Long Do Whatsapp Messages Stay on the Server? These are list of errors, if you are getting one of these errors while you are installing WhatsApp, please click on the related error to see solutions. These are error codes that you can face on WhatsApp and on Android devices. If you have any question about these errors, please let us know. Let’s see other errors that you can have on WhatsApp. This app is incompatible with your Android Device. These are all errors that you can get with your Android device while you are installing WhatsApp. If you are getting any other error on your device, please let us know with our Question and Answer service, Community Service, contacting us or commenting this page. We are going to provide for your problem in our pages as soon as possible and we are going to get in touch for you to provide our solutions. How to Chat Online doesn’t require personal data, cash or something else for support. Feel free to contact us through commenting this page and sending a mail to howtochatonline@gmail.com. One of our experts is going to respond you and help you about your errors on WhatsApp. Delete cache and data of application. Download the application from the official source of WhatsApp. Contact the official WhatsApp support.